Steve: I never welcomed you to the forum as I was off line for a while, but it is great to have a knowledgeable guy like you on board. Thanks for your comments on club sedans... my favorite closed models. I told A.J. before, but his is one of the greatest closed classics I remember seeing (even compared to the 20 Grand, at least in my own book). The design was gorgeous, and though he has mentioned it was shared with 3 Packards, the Royale looks even nicer for the real added length or the apparent one, with the radiator shell painted. Truly, an outstanding car. Steve & Victor, thank you both for your comments. They make me feel better as I'm writing another check to further the progress. I have an obsessive compulsive disorder when working on the cars that things need to be fixed exactly right. That can be extremely dangerous when dealing with a 30 year old restoration that was basically cosmetic to begin with. Steve, when you say three box, does that refer to the hood, body & trunk as the 3 boxes? I wish I was going full body with the original deep red color but alas that would be biting off more than I can chew right now. We are going to respray the fenders in the current body color which is not that close to the original but much better than the gold which offends my eyes. Fixing things correctly is exactly the right obsessive compulsive disorder to have when it comes to Classic Cars! There are various ways to definite what comprises the 3-boxes but the one that seems to make the most sense is: box one is the section forward the cowl/windshield line that houses the engine and radiator, box two would be from the cowl/windshield line rearward including the trunk but below the belt-line, the third box is the greenhouse, everything above the belt-line. The best part is when a long-wheelbase Classic is so proportioned is becomes very elegant. 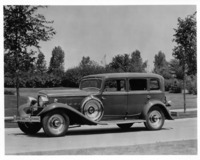 The three Packard 845 Dietrich Newport Sport Sedans are the most desirable of all closed Packards that year, along with similar but not quite 3-box Waterhouse and other custom coach-built examples. Only the various convertible victorias are on par.....in my aesthetic judgment. Steve came by our booth at Hershey and introduced himself. I owed him a cup of coffee for that mechanics manual he so generously gave me. We had a great talk. He is working up some drawings for what he thinks the Dietrich 4 door convertible might have looked like on the long wheelbase. As everyone knows there are no pictures of that car. Looking forward to seeing the drawings! It was great meeting you, I really enjoyed our intense automotive discussion......something that I only rarely get to enjoy. I also enjoyed meeting and discussing old cars with your dad. Hershey is the absolute best place for us to have those rare encounters. My Royale convertible sedan concept drawings are in the development stage, I have about four different versions in mind. Right now, they're rather crude sketches. I'll gin up a good, large profile of your 8-48 for the line drawing layout to do the perfected elevation drawings. That's how custom coachbuilders presented their designs, has to be good enough for me too. So, be patient, and stand by, I promise it'll be worth the wait! 1. Wiring harness is almost completely out. There are parts were it is stuck and we are soaking it. 2. Drilling out head bolts one by one to free the head. Most of the center row has now been drilled out. Gone through 7 hardened drills so far. 3. Welding up excess holes in the firewall and then we will repaint gloss black. 4. Water pump finally came apart and a new shaft has been fabricated out of stainless. A new bearing procured. 5. I have decided to pull the generator and starter out and have them rebuilt while everything is apart. 6. Built a wood frame for the windshield frame so that the chrome process doesn't distort it. 7. Got the throttle and headlight levers out of the steering wheel and sent off to be re-chromed. 8. Mulling pulling the dash out and completely restoring it. Congratulations! I am envious! Can't wait to see a pic of the car out again with it's new red monotone image with copper mouldings... which is how I understood you will be doing it. It will be stunning! Victor, I think the correct 18 inch wheels, painted with blackwalls will also improve the appearance. I'm sure that I'm going to end up painting so much of the car that I should have started with the original red instead of the current color. Wheels painted in red? Copper? Anyway, it will look stunning. The original color was a darker red so I was thinking about that for the wheels. I'm open to suggestions. The only color I have ever painted wheels was black but I'm not sure that would work here. Sorry I wasn't clear with the question... yes, that is what I was meaning to ask when I said red... I meant body color dark red, or trim color, copper. Thanks for asking but I don't know what to say...I honestly couldn't be sure which would look better, but personally, I think I would go for the body color.... but since the car will be almost monotone, and with blackwalls, it will look probably a bit to sober. Being yourself an avid and knowledgeable computer guy, and since you already did that modified pic at the beggining of the thread in which you removed the trunk rack and 'added' blackwalls... perhaps it would be a good idea to use that same pic adding body color to the fenders... and then it will probably be a bit easier for you to decide on wheel color. On such an important car, I would certainly consider chrome wheels also, though I am no true fan of them... but if you look at the Packard Dietrich at the first page of your thread, the black and white pic, it would appear to have chrome wheels... and the restored Packard looks gorgeous on chromed wheels, plus on your car it would really set the blackwalls apart. My two cents worth: paint the wheels body color and use a chromed snap ring. In reading your recent posts, it reminds me how difficult it is to do a little freshening up. There is no place to stop! My two cents too: painted wires and blackwalls with simply trim rings and hubcaps look not only subtly elegant but very period correct as well. Chromed wires and blackwalls have a purposeful sporty look but have to be hideously difficult to maintain looking good. Its doubtful many buyers opted for chrome wires in the period......perhaps a convertible coupe owner or two. Take a look at page four of the REO Marksman with "First Glimpses of Reo-Royale in The Public Eye". In the lower half, a sedan is shown on the football field with what look to be chrome disk with some body color rings and blackwalls, the sidemount covers fully chromed. Were those disk wheels optional? Has anyone seen them on another Royale in period photos or have a car with them now? Packard offered chrome disks in that period so they weren't unknown then. I agree that body color wheels with a chrome snap ring would look great (particularly on darker colors and more so with blackwalls). I have only one pic of an original car with chrome discs... I am not really too fond of them. By the way,, the Price list does not list them as optional, and it does list the wooden wheels and the stainless Steel spoke wheels. Yes, Packard offered the chrome discs. I have been after a 1930 840 roadster almost forever, which has them, owned by a good friend of mine. By the way, I bought my 1933 1001 convertible coupe from his brother, which had painted wheels in dark green and I added the chrome trim ring... They look good, and will look better once I switch to blackwalls... if I ever get to that. Good job Victor posting that picture and price list. I mentioned both to Steve in the Marksmen thread.